On February 27, 1995, Truth For Life began airing its 25-minute daily program on seven radio stations. Today, Truth For Life can now be heard in every major radio market across the U.S., and also in select Canadian markets, through 1,655 radio outlets. The unique, expositional teaching of Alistair Begg is now internationally known as an inspiring source for clear, relevant instruction rooted firmly in the Scripture. Studying God’s Word each day, verse by verse, is the hallmark of this ministry. Passionate about seeing unbelievers converted, believers established, and local churches strengthened, Truth For Life faithfully looks to God to proclaim His Truth through the program and to transform the lives of those who listen through His Spirit. In 2009, driven by the desire to share the good news of the Gospel without cost as a barrier, the ministry made the entire Truth For Life teaching archive free for download at truthforlife.org. Since then, over 55 million messages have been downloaded. Because of this encouraging response, Truth For Life made all of its CDs, DVDs, and books by Alistair Begg and other featured authors available at cost—with no markup—in 2011 and now routinely distributes over 10,000 resources each month. In addition, people all around the world can now access the teaching of Alistair Begg through two convenient mobile apps, on podcast, and even streaming television. Truth For Life also connects with listeners at live ministry events and conferences across the US and Canada in cities where the radio program is heard. 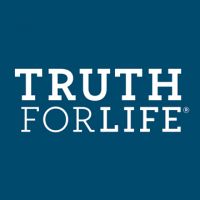 Led by Alistair Begg and overseen by an independent, volunteer board of trustees, Truth For Life is a Bible-teaching ministry seeking to faithfully proclaim the Word of God and is committed to highest level of financial stewardship. Over 95% of donated funds go directly to ministry expenses.